Noble Outfitters Outrider Glove | 51000. Just like the outrider at the track, the Outrider Glove is ready for anything. From mucking stalls to tacking up, or going for a ride, the Outrider Glove fits comfortably and keeps you protected. The double layer reinforced synthetic suede palm, forefinger, pinky, and fingertips, along with double stitched critical seams, and padded, reinforced knuckles make the Outrider Gloves extremely durable and hard-wearing. The Outrider is made with a breathable stretch knit fabric back of hand for ventilation and close comfort fit. The hook and loop wrist closure keeps debris out and strategically placed terrycloth helps you wipe your brow after a long day. 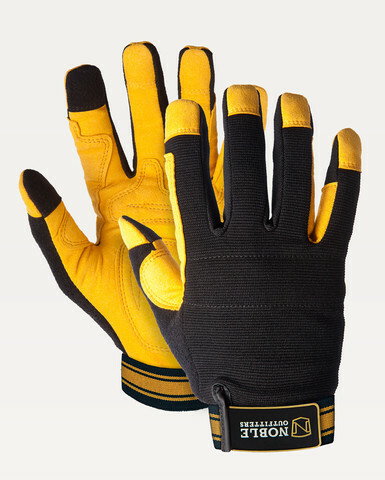 It is touch screen friendly so you can keep your gloves on and stay connected.